Connecting an audio mixer to an amp is a simple process and can be accomplished using a guitar cable. 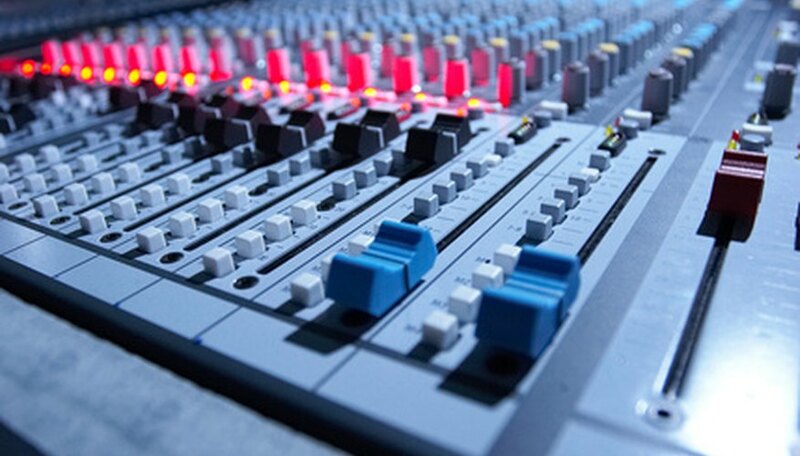 Mixers are used to control the sound of more than one audio device at a time. You can listen to all of the connected devices when you connect a mixer to an amp. Many mixers come with different types of ports and features, but there should be main input and output ports on both the amp and mixer. It’s also important that you read the user manuals for your mixer and amp to better understand your equipment. Unplug your mixer and amp from any outlet or power source. Make sure the mixer and amp are both turned off. Insert either end of a guitar cable into the “Input” port of your speaker amp, located near the top of the amp by the "ON/OFF" switch. Insert the other end of the guitar cable into the “Main Out” port on your mixer, located near the top of the mixer. Plug the two-prong end of the power adapter for the mixer into an outlet and connect the other end of the adapter to the back input on the mixer. The mixer should turn on. Plug in the power supply for the amp into an outlet and flip the “ON/OFF” switch to the on position. Your mixer and amp will be successfully connected. Use another guitar cable to connect an instrument to a mixer by inserting into one of the &ldquo;LINE IN&rdquo; ports on your mixer. You then will be able to hear the instrument from your amp.